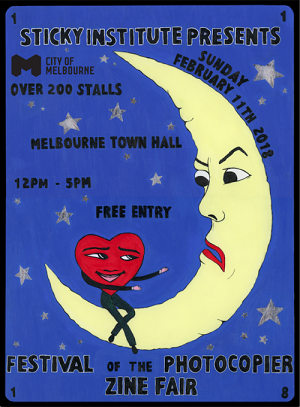 Sticky's massive annual zine fair - perhaps the biggest zine fair in the Southern Hemisphere - returns in 2018 with over 250 zine stalls in the biggest room of the Melbourne Town Hall. Entry is free! Festival Of The Photocopier (#FOTP2018) is a weekend celebration of zines and zine culture, taking place in 2018 between Thursday 8 - Sunday 11 February. For more information visit here. If you'd like to hold a stall, zine stall applications are now open here. Melbourne Town Hall, Sunday 11th February, 12-5pm.